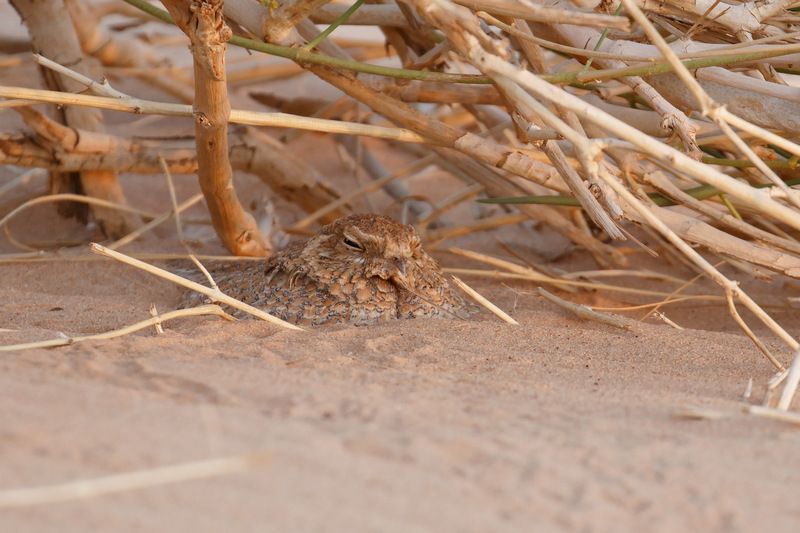 Golden Nightjar was recorded for the first time in the Western Palearctic (WP) region as recently as May 2015, when a male was unfortunately hit by a car and killed along the road to Aoussard, Western Sahara. At first it was assumed that this might be a vagrant, although in March 2016 an unusual, repetitive call was heard at night by German birders at Oued Jenna, along the Aoussard road, not far from where the 2015 record had been made. It was initially thought possibly to be a Red-necked Nightjar, but this was subsequently dispelled on their return home, the call clearly identified as belonging to Golden Nightjar. Just days later, BiOME researchers found three territorial male Golden Nightjars in the same area. It has subsequently become established that the species is evidently regular, if not resident in the right habitat in Western Sahara, with multiple birds observed between February and May each year, and at multiple sites some distance from each other. Furthermore, in April 2016, Eric Didner visited northern Mauritania and found at least one male in the large wadi north-east of Ouadâne, just north of the 21°N line that defines the southern boundary of the WP (as defined by The Birds of the Western Palearctic), with birds observed again there in April 2017. 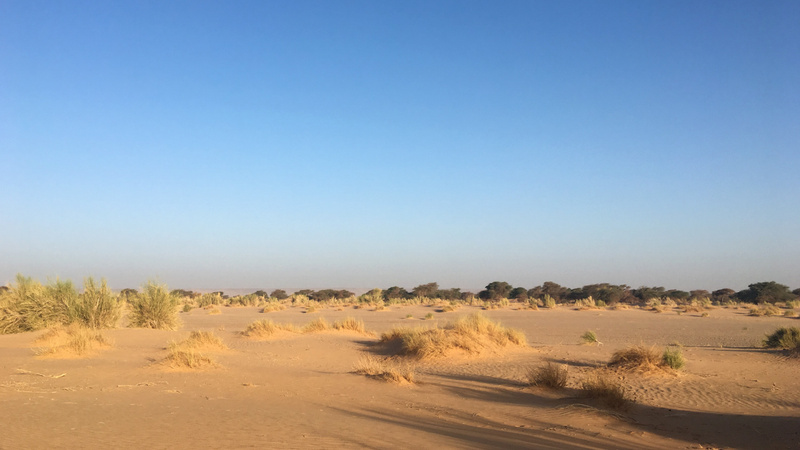 Golden Nightjar habitat north-east of Ouadâne, Mauritania, April 2018. The birds appeared to prefer scrubby patches intermixed with more open, sandy areas, generally keeping away from the large acacias (Josh Jones). Although the continued presence of the species at multiple sites across Western Sahara and northern Mauritania strongly suggests that it is breeding, reproduction had not been confirmed until this spring, when a team of five birders, including myself, chanced upon a nest just a few hundred metres north of the 21°N border near Ouadâne, Mauritania. At dusk on 18 April, during a concerted effort to locate Golden Nightjars, Dan Pointon picked up a male giving snippets of song around 200 m to the south of our camp. With the five members of the team widely scattered in the wadi, it took the best part of 30 minutes for us all to reconvene at the spot. Although the bird didn't sing again, scanning with torches eventually picked up eyeshine and we went on to enjoy crippling views of the nightjar actively hunting crickets to within 10 m of where we were stood. Curiously, it would sit on the floor, scanning for food items, before jumping and fluttering up to a metre or more in the air to catch its prey. We returned to the same area before dawn on 19th to find the bird again singing. However, it proved far less confiding than the previous evening and ranged widely, rarely settling in one place for long. With first light upon us, we figured the nightjar would be roosting close to where we last heard it, so we set about checking under small bushes in the unlikely event that we'd find it. Given how fanciful the idea of locating a roosting nightjar in a huge area of habitat seemed, it was with incredulity that Dan found a bird sat under just the second bush he checked, staring back at him from a few metres' range. The nightjar flew and Bob Swann, who was close to Dan, immediately went to check the spot in case there was a nest. 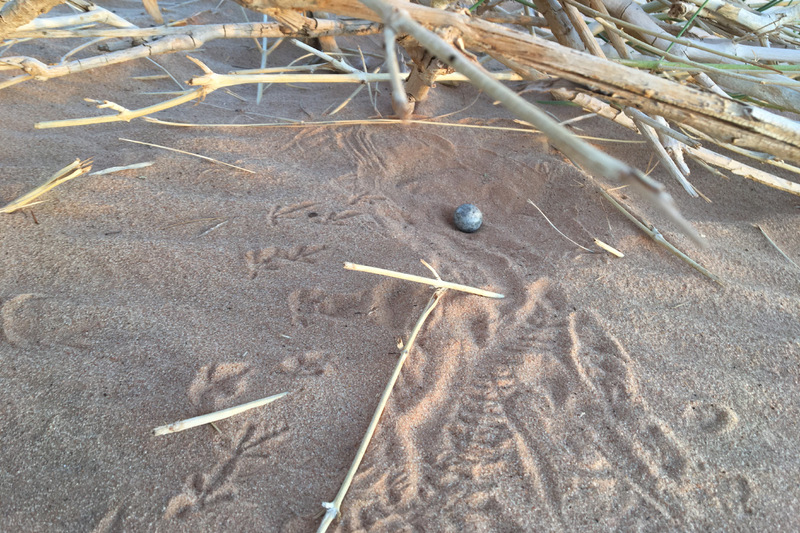 To his amazement, there was indeed a 'nest' – little more than an undecorated scrape in the sand – bearing a single egg. The adult bird was sat under a nearby bush and so we soon retreated after taking a few photos of the egg and nest, allowing it to fly back in and recommence incubation while we watched. Flight views of the adult showed it to have buff tips to the tail, making it a female – we assumed that the male must be roosting close by, though we didn't see it. Golden Nightjar nest, Ouadâne, Mauritania, 19 April 2018. Note the footprints of the adult bird leading to and from the nest, which is little more than a shallow depression in the ground (Josh Jones). Incubating female Golden Nightjar, Ouadâne, Mauritania, 19 April 2018. Photographed with a 400 mm lens from a safe distance, after it had returned to the nest (Josh Jones). Then, on 19-20 April, we visited the large wadi and oasis at El Beyed, some 60 km north-north-east of Ouadâne. Although quite heavily grazed, plenty more suitable Golden Nightjar habitat occurs here and we duly found at least two birds: a female, presumably just leaving its roost, flew past our camp at dusk on 19th and at least one male was heard singing that night. Then, the following morning, we found what must have been the same female roosting under small bushes right next to our camp, this bird allowing us to enjoy extraordinary and prolonged views. This represents a new site for the species and further reinforces our belief that Golden Nightjar must be quite widespread, even locally common, in the right habitat across the region. A full documentation of the breeding occurrence will appear in a forthcoming issue of Dutch Birding. For more photos of Golden Nightjars, please visit the Mauritania gallery on my website. Golden Nightjar, El Beyed, Mauritania, 20 April 2018 (Josh Jones).